This casual monster is difficult to deal with and takes out multiple problematic noncreature permanents. It is a favorite in casual and commander decks. The price tanked when it was reprinted in Modern Masters last year but has been slowly recuperating. I expect these to keep climbing until they get back to around $6. Amulet of Vigor came out of nowhere earlier this year to create a quirky but intriguing fringe deck. It had been a bulk rare for years but a few prominent displays on camera and the genie is out of the bottle. Be warned that the deck can be difficult to pilot and inconsistent but it is here to stay. I expect Amulet of Vigor to continue to grow slowly but steadily until it starts getting real results or is reprinted. You can still pick these up for as little as $2.33 and sell them for as much as $2.51 or just sit on them until they hit $5. Chandra, the Firebrand has some casual appeal. She is used in Commander and Cubes on occasion. She has seen two printings in core sets. She never really saw any competitive play while she was in standard and nothing to speak of in eternal formats. I do not see any real justification for the price adjustment. I would trade these away for $4 while you can. Enemy painlands have been getting a lot of attention lately with their standard reappearance. Allied painlands are still relatively cheap pick ups. Underground River is played in Modern UB Faeries. If the deck gets any traction then these will jump. You can currently buy the 6th Edition copies for as little as $0.99 and sell them for as much as $1.25. Flames of the Blood Hand is played in Modern Burn and Red Deck Wins. It is a powerful card out of the sideboard to shut down life gain and keep the deck’s game plan on track. I could not find any recent successes to explain the bump but I find it interesting that the price is approaching the $5.82 that the Premium Fire and Lightning Deck copy goes for. I would try to snag a few copies of the Fire and Lightning versions before the price adjusts. Even though Modern Melira Pod only runs a single copy Orzhov Pontiff has been benefiting from Top 8 placements. This is a bit higher than I would expect to see for a card that is only played as a singleton even if it is in one of the better positioned decks in the metagame. I would start looking to trade these away. All Is Dust is a colorless sweeper that you can build around. It can get around Regeneration and Indestructibility. It is a popular inclusion in Commander and Cubes. It is also used in some competitive decks. Modern uses it in Tron variants and has even seen some Top 8 success with it. Legacy can use it in MUD to get rid of even the toughest True-Name Nemesis. It somehow was not included in From the Vault: Annihilation so it is safe from reprint for a while. I would pick up the GP Promo version. It is actually cheaper at $14.89. Legion Loyalist is enjoying a lot of attention in its last few weeks in Standard. It is in Rabble Red, Boss Sligh and Red Deck Wins variants. The problem is that is it about to become a bulk rare. Get out now. The sudden demand has made this a lot easier to buylist to vendors that are trying to fill orders. You can currently buylist these for $2.80 and $5 for the foils. Xenagos, the Reveler was the talk of the town last week. Rabble Red is good for a budget deck but when you want results this is the planeswalker we come to. He can give you a ritual to ramp into larger threats or give you an unlimited supply of Goblin Guides. It makes the Raging Goblins that Goblin Rabblemaster spits out look anemic. Although Xenagos requires two colors of mana he still shows up in a surprising variety of Top 8 decks. He is played in Jund Walkers, Jund Monsters, GR devotion and Brave Naya. He will probably be finding a home in Temur (RUG) decks soon. I really like him as a pick up if you can still find him under $10. I could see him getting to $20 or more after rotation. What happened to Squelch? You could still find these for a dollar just a week or two ago. Mono U Tron runs a pair in the sideboard. It is an appealing deck because it is relatively cheap. You only need a single copy of the expensive cards and even the play set of Remand is lot cheaper thanks to Jace vs. Vraska. This is the closest we get to Stifle in Modern which comes in handy when someone is trying to crack a fetchland or activate Birthing Pod. That being said how much higher can Squelch get? There are only so many uncommons that command $4 and they are casual or competitive all stars. This is certainly not on the same level as Tectonic Edge or Spell Snare. I would unload these while you can. Hopefully you stocked up the past few weeks I have been mentioning it. Now it is pay day. Eight-and-a-Half-Tails has a name and creature type that makes it very difficult to reprint outside of a supplementary product. He is a white Cancel on a stick which is helpful for protecting your permanents or even pushing through late game damage past your opponents defense. It is played in modern Death and Taxes and works very well with the Aether Vials the deck packs. Kamigawa was a long time ago and all indications are that we are not going back any time soon. Supply is low and not going anywhere. I like these as long term holds. They will continue to grow in value. At the very least it is a unique white commander that offers abilities that other commanders in the color are unlikely to replicate. Endless Horizons is used in some commander decks and in modern Mono-White Prison as a singleton. The effect is interesting but has some inherent risks. It used to be $2 at the beginning of the year. Overnight it was bought out and vendors adjusted the prices accordingly. It has not really earned its place. This card is going to keep going down until it hits the $3 to $4 range and sit there. I would trade these away while you can. Demigod of Revenge was a victim of Modern Masters. It has been outclassed in terms of reanimation targets and does not even get a place in most Dredgevine Decks. It is still a great casual card and usually gets traded in play sets but it was a prerelease promo and now it has been reprinted without any additional demand. I think you will soon be able to pick up your play set for under $10. Get out. I keep forgetting this card exists. That is because even in decks it should be good in it is slow and clunky. How many auras are worth reanimating? I would rather have Sovereigns of Lost Alara or Bruna, Light of Alabaster for my $2 aura enabler. Only the most casual of aura decks is looking at this card. That does not mean that is useless to us. You can still buy them for as little as $1.20 and sell them for $1.52. Even better the Judgment foil can be purchased for $1.36 and sold for $2.00. 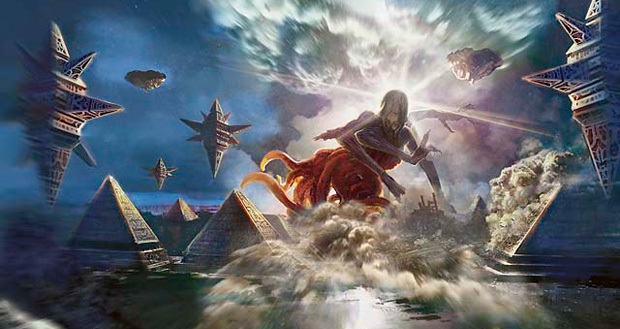 Banishing Light is going to be a constant presence in standard for at least the next year. It has been used in Orzhov Midrange, Azorius Control, Selesnya Aggro and even Boros Burn decks. It deals with any problems you have and is an easy splash. However this is going to be reprinted in core sets for a long time to come. Modern already has Oblivion Ring and Detention Sphere. It does not need Banishing Light as well. Keep a play set to for your standard decks but I would buylist the rest for $1.28 while you can. Or trade them for cheap gods like Ephara, Karametra and Kruphix. I really like the attention to detail you put into these, but I wonder if maybe instead of focusing on the numbers so much, you could look at the bigger picture a little more. I mean is the fact that nomad myth maker went down 40 cents really helpful to anybody? I would like to see you approach these articles from a more practical point of view. Rather than just talk about whatever cards “changed” in price the most percentage wise, (because a lot of times those changes just seem like random fluctuations), talk about the changes that actually matter to the reader as an mtg financier.